Why couldn't you do this twice a week? It'll be a bit too much for me, especially once we get into the later series where the amount of mechas start to quadruple. I think what hurts Live Robo the most is the coloring: the helmet and the colors outside the prominence of Land Lion just hurt is horribly. (as much as I hate this season, Land Lion is beautiful and really the biggest and most important thing to come from this season for the franchise) Super Live Robo I think fixes some of that with the colors of Live Boxer at least making it appear a bit more civil than the mess of it's previous form. I don't think it would be too much. How about another mecha lover divides up the work for speed? It's just posting the images and your opinion, which is followed by others'. How about another mecha lover divides up the work for speed? Part of the process for these post is that I write them out over the course of the week rather than all at once. Helps to simmer my thoughts a bit. Not entirely sure how that would work since this is more of a personal project of mine. Just to help you in order to speed up the process. The thing about these post is that they are techinically reposts. I already have them posted on another site for about a week prior to when I repost them here. Is the site, the forum we're not allowed to mention by name? Kamen Rider Ghost was there to promote...something. The Ichigou movie, technically, which is why the monster's part of Shocker. Ghost's just there for fun. With ToQger/Gaim and Ninninger/Drive they did actual crossover TV specials, but they seem to have lost interest in those. The Kyu/Ex-Aid crossover was even more half-arsed. Quarter-arsed, you might say. It's Tokunation which I believe I'm allowed to mention. So I decided to take timegold, and Ataruman's advice, and watch Bioman. I watched the first 6 episodes last night. So far I think it's okay but that's mostly because so far it seems like only the Shiro, Shingo, and Mika have had any focus episodes. I do like the gimmick that they have five monsters they alternate through for the ground fights, and just have a new monster for the giant fights. Especially since even when the other bad guys use different Beastnoids Monster always uses Jou for his Beastnoid. Name of the skin is "Sentai", but has elements of both Super Sentai AND Kamen Rider. 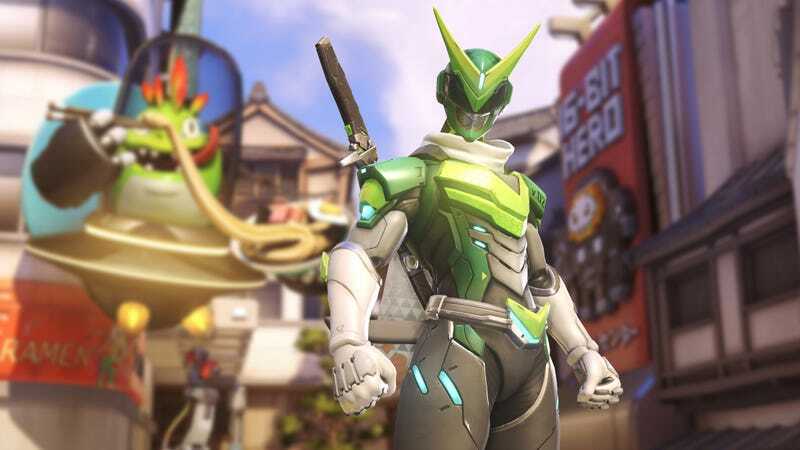 To further the connection, if you play Genji with the skin equipped, his voice lines will change to some very...toku specific lines. Voice lines start at 2:11. Apparently, someone at Blizzard is a huge Gekiranger and Go-Onger fan. That's it for 40th anniversary stuff during the TV series. They wanted to let Zyuohger be its own season the rest of the time. The movie and the Vs will have more anniversary stuff. There's also the 4 Super Animal War shorts, but were those ever English subbed? The first three have been subbed by TV-N. The fourth wasn't released yet. So I'm currently 24 episodes into Bioman. I'm glad I at least got to see focus episodes for Ryuta, and Hikaru. Also I enjoyed the Prince episodes since there the closest the show has had so far to having an over arching plot. I think my only problem is that it seems like Jun was the only one who's job or hobby has become a plot point for an episode. I especially think it's weird because I can't help but wonder if that one episode where Hikaru got brain washed by the camera wasn't originally supposed to be a Mika episode that they retooled.